In 2013 with the industry migrating toward software defined networking (SDN) and network function virtualization (NFV), OIF identified gaps in the application of SDN concepts and practices for transport infrastructure and service delivery. The organization launched an initiative to fill in the missing pieces in information-modeling, APIs and interoperability. In 2018, in collaboration with the ONF, OIF successfully concluded multivendor interoperability testing of the ONF T-API 2.0 northbound interface. To facilitate the next steps in mass commercialization of Transport SDN, the OIF subsequently launched Requirements for Integrated Packet Optical SDN, which will generate functional requirements, a reference architecture and use-cases. In parallel, OIF is evaluating formation of a Transport SDN certification program. When SDN concepts emerged, one of the main concepts that has remained at the fore is separation of control plane and data plane functions. There was initially considerable focus on south-bound interfaces, the interfaces between the SDN controller and the underlying network elements. OpenFlow (OF) emerged as a language for programming a set of match-action rules into the network elements. OpenFlow extensions were developed to support optical networking equipment and transmission and were also included in the OF1.5 specification. At the same time as the Open Networking Foundation (ONF) was working on OpenFlow extensions, the ONF also formed a common information modeling working group. Abstraction and data modeling remain core tenants of Transport SDN solutions today, and the OIF has been a critical contributor to the success of unified data modeling for optical networking infrastructure. In 2014, OIF executed its first global multivendor Transport SDN interoperability testing with 17 vendors and service providers. Although a large portion of the testing focused on south-bound interfaces such as OpenFlow, the testing identified existing interfaces in the optical transport industry and satisfied the immediate need for south-bound interfaces. There was greater need for increased openness and consistency on the north-bound interface between the controller and application layer. Following the 2014 interoperability testing, OIF published The Framework for Transport SDNand shifted its focus toward the creation and dissemination of an open north-bound transport application programming interface (T-API). Based on the work of OIF, the ONF assumed authorship of a new T-API specification for SDN. When a T-API 1.0 specification was in hand, OIF led another round of Transport SDN interoperability testing in 2016. 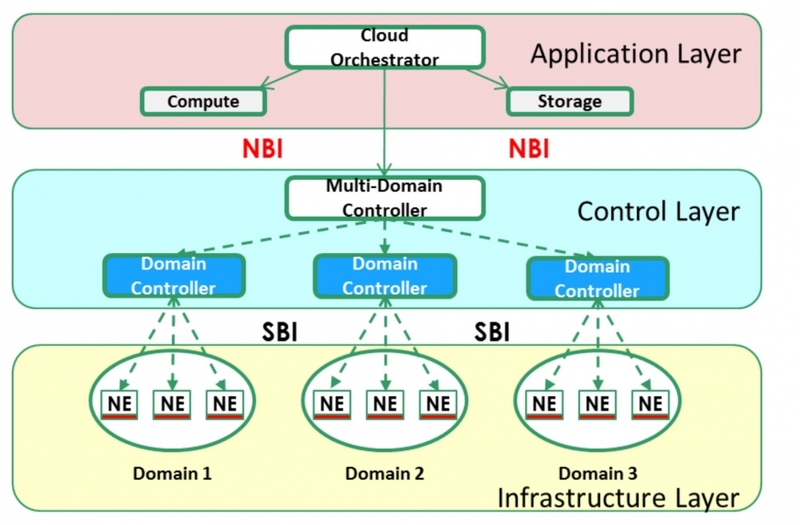 The results of the testing demonstrated how a common, open north-bound interface could be utilized across vendors and service providers for network topology discovery and provisioning of connection-oriented services. However, T-API 1.0 was lacking in support of dynamic behaviors like the ability to inform upper layers about network congestion and re-route impacted traffic. Dynamic behaviors were written into the T-API 2.0 interface specification and in 2018 OIF in partnership with the ONF conducted another round of service provider and vendor Transport SDN interoperability testing. T-API 2.0 also includes collaboration with the MEF, which is active in the area of Lifecycle Services Orchestration. The MEF has adopted and extended T-API 2.0 as part of its network modeling and provisioning work and in conjunction with the Presto interface definition between service orchestration and infrastructure control and management layers. Following the success of the T-API 2.0 multi-vendor interoperability testing, OIF announced thelaunch of a follow-on project, Requirements for Integrated Packet Optical SDN. The goal of the project is to provide a broader solution overview and context to the deep technical work of APIs and interface specifications like T-API. The project will focus on three main deliverables: functional requirements, a reference architecture and use-cases for open packet-optical networking solutions. In addition, OIF is currently evaluating the launch of a Transport SDN certification program for vendors and service providers. The goal of such a certification program is to make it easier for vendors and service providers to communicate and advertise their open, Transport SDN capabilities and maturity levels in conformance with set of a defined standards and behaviors. In a similar manner, when Carrier Ethernet was first emerging into the market the MEF successfully launched a certification program for vendors and services providers, helping to propel mass commercialization and adoption of Carrier Ethernet services. OIF has played a key role in the evolution and maturation of open Transport SDN solutions. Where specifications are required, OIF has authored them in the form of Implementation Agreements. Where input and guidance are required to positively impact existing specifications or initiate new work in standards bodies such as the ONF T-API interface, OIF has contributed. OIF has also demonstrated its willingness to lead with years of multivendor interoperability activities and events. Although the 2018 interoperability event demonstrated that Transport SDN is maturing, OIF realizes that beyond detailed modeling and interface specifications a broad solution overview and architectural framework is required if we are to push Transport SDN into mass commercialization. OIF is not merely pointing out the need, but also addressing the challenge with the launch of a new project and targeted deliverables for the industry.